CCT FIBER Synthetic Crystal fibers from Cascade Crest tools A soft highly translucent fiber. It almost has a crystal like appearance. 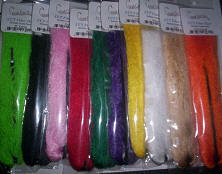 Used in any streamer and salt water pattern. An excellent choice for Hi-Vis parachute patterns and terrestrials. Comes in a 2 x 8 inch pack.